1. Mix turmeric powder, saunf and ginger powder in a bowl. 2. Marinate the fish slices in this for 1 to 2 hours. 3. Heat ghee in a pan over moderate flame. 4. 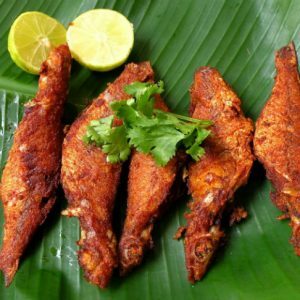 Fry the marinated fish slices until they start to change colour. Ensure they are not overcooked. 5. Remove and drain excess oil. Keep aside. 6. To the same pan, add the ginger paste, dry red chillies, cumin seeds, coriander powder and red chilli powder. 7. Fry for 45 to 90 seconds and reduce flame. 8. Add the yogurt and cook till the ghee starts to separate. 9. Add the fish slices and salt. 10. 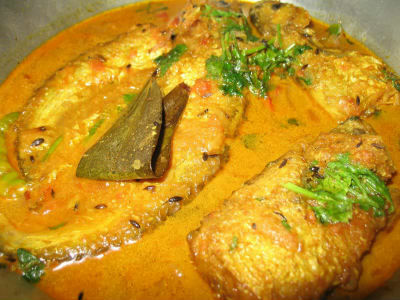 Stir well and simmer till fish becomes tender and coated well with masala. Feel free to comment or share your thoughts on this Macchi Pahalgami Recipe from Awesome Cuisine.